Colour photograph showing the fire at the Whitby Psychiatric barn. The Whitby Fire Department is attempting to put out the fire. The barn at the Whitby Psychiatric Hospital was built in 1919. It served the patients, staff, and doctors at the hospital as part of a fully functioning farm until 1969. The fire, allegedly started by a patient at the hospital, occurred on 4 November 1976. It took 90 minutes for the barn to burn to the ground. 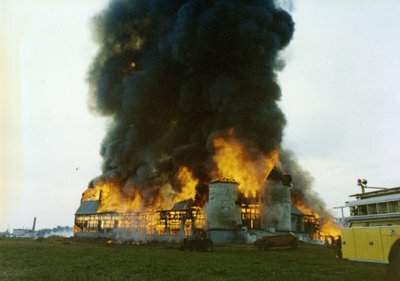 Whitby Psychiatric Hospital Barn Fire, 1976, David Mitchell. Whitby Archives A2014_010_013.